The Stokes 148H is an Oil Flooded Rotary Piston Pump that is used in a wide range of industries to enable reduced pressure environments. 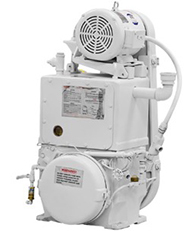 There are two versions of the Stokes 148, including the first generation 148H-9, which had the inlet and the exhaust on the same side of the pump – making it difficult to add a blower option. Stokes eliminated this issue with the 148H-10, which has the inlet and exhaust on opposite sides. Both the 148H-9 and 148H-10 share the same internal and external parts with the exception of the block. Unfortunately, Edwards (who now owns the Stokes product line) has discontinued the 148H series. However, Trillium produces a drop in replacement called the Univac 100, which features 100% interchangeable parts with the 148H-10. DID YOU KNOW? Trillium not only refurbishes but also services and repairs the Stokes 148H Piston Pump. Visit our Piston Pump Repair Pagefor more information. All 148H Series pumps share the same data below. Download the full manual below.